The ornaments and gifts that I have created are my original designs. They can be ordered in any color and larger if desired. Please email me at kp.forney@gmail.com for questions or to place an order. This adorable ornament is available in a variety of colors to try and match your pup. Custom orders are always welcome!!! Each pup is wearing a custom witches hat adorned with black beads on a green band that is sprinkled with clear frit that reflects the sunlight. Each pup carries a bone wrapped in a decorative cord that holds a 'Boo' charm. The bones are available in beige, white and black. The happy pup has pink cheeks. The cute 4 inch x 4 inch suncatcher has a web in your choice of black, gray or white. All suncatchers three spiders in black with cute little legs. 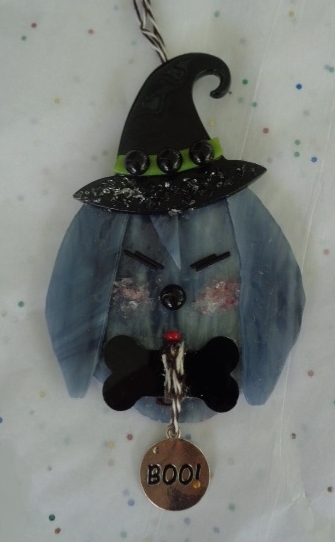 The suncatchers are bordered by a mixture of gray, white and clear frit that reflects the light as a Halloween charm dangles from the corner. All are mounted on a transparent orange glass. You have a choice of a cat, a witches face, a Raven, or a haunted house. This adorable ornament is available in a variety of colors to try and match your cat. Custom orders are always welcome!!! Each cat is wearing a custom witches hat adorned with black beads on a green band that is sprinkled with clear frit that reflects the sunlight. Each pup carries a bone wrapped in a decorative cord that holds a 'Boo' charm. This lucky shamrock ornament will spread luck all year not just at Christmas. The ornament measures 3 x 3 inches . Surrounding the lucky shamrock is clear crushed glass that reflects the light . This unique ornament is a wonderful gift for anyone who likes wolves. It can be displayed at anytime of the year. The wolf and grass are accented with tiny pieces of glass that accentuate the light. The ribbon used to hang the ornament is covered with little paw prints. So cute!